Dayquil is an over the counter medication that is relatively safe for all patients, but some side effects may be experienced. These can include common side effects like drowsiness and dizziness or serious side effects like usual bleeding or fainting. These side effects are also more common if the patient is taking another medication or has an underlying medical condition and information about these and other Dayquil side effects are discussed below. Although these symptoms are not considered to be serious, patients should consult with their physician if they worsen or do not go away. If any of these side effects are experienced, patients taking Dayquil should consult with their primary care physician. With cardiovascular disease, there is high plausibility for severe potential hazard. This is because the components of Dayquil can cause adverse cardiovascular side effects in particular when it is taken in high doses. This can result in hypertension, palpitations, coronary occlusion, myocardial infarction, cardiac arrest, or death in some patients. 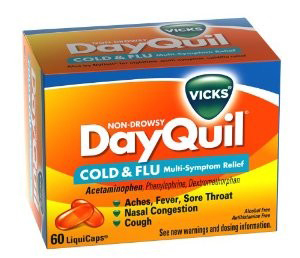 Dayquil is a relatively safe over the counter medication that provides relief from symptoms of the common cold or flu. Although this medication cannot cure these conditions or speed up the recovery process, it can help to make them more livable. Despite its over the counter status, some side effects, both common and serious, may be experienced. It is especially important for patients to consult their doctor if they are taking another medication or have a pre-existing medical condition.